The VTF4-CP12 Contractor Pack of 4U Tight-Pattern Vented Blank Panels (6 Pieces) from Middle Atlantic is a pack of vented blank panels designed for use in a standard 19" equipment rack. 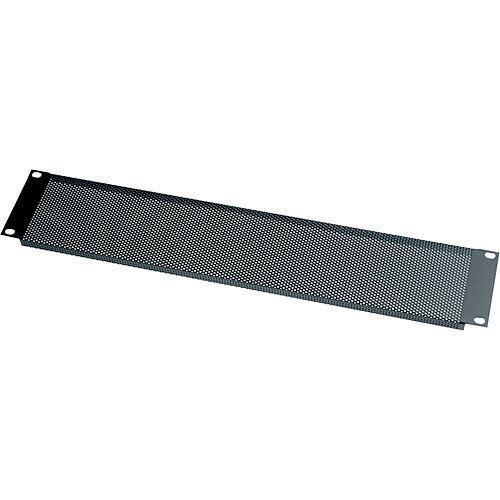 Use a blank panel to cover unsightly open space in your rack and protect your equipment from dust and other foreign debris without restricting air movement. Each panel's vented face promotes adequate airflow to help maintain low operating temperatures in your enclosure, but also features a tight hole pattern for improved aesthetics and restricted view inside of your rack. It is constructed of steel with flanged edges, features a black power-coat finish, and occupies 4U of rack space. This unit is a special contractor pack intended for those whose work requires the purchase of panels in bulk. Buy this bulk pack of blank panels to ensure you always have the supplies on hand to meet your ongoing needs. Dimensions (HxW) 7 x 19"
Box Dimensions (LxWxH) 22.2 x 8.9 x 6.4"